Well, after months of this, Amazon has taken up a new strategy in its dispute with Hachette — to tell us what they want and why. Suffice it to say, this is an approach that we can only welcome as it allows us to delve deeper into the dispute and the nature of book publishing and retailing these days. That said, while it answered some questions, it opened up a few others. 1. The interval price elasticity of demand between $9.99 and $14.99 is 2.42. (That is, a 33% price fall leads to a 74% quantity increase although a mid-point method might give a figure more like 1.88). That means that charging a price of $9.99 rather than $14.99 allows the book to earn more revenue. (In Amazon’s example 16% more revenue — which is alot). So Amazon want Hachette to price at $9.99. 2. Amazon wants to give Hachette 70% of these revenues which Hachette will, in turn, share with the author. 3. Amazon argues that Hachette should share half of that amount with the authors (or 35% of the total) but isn’t looking to impose that. What this means is that (3) isn’t part of the dispute. Since Hachette is not agreeing to this, it must mean that the dispute is over (1) and (2). So let’s think about those, in turn. As Amazon writes “[w]ith an e-book, there’s no printing, no over-printing, no need to forecast, no returns, no lost sales due to out-of-stock, no warehousing costs, no transportation costs, and there is no secondary market.” This suggests that even the $9.99 price is way too high. If marginal cost was more like $0.50 (to take into account credit card fees and the like), then the price elasticity of demand that would make $9.99 the optimal price would be 1.05. 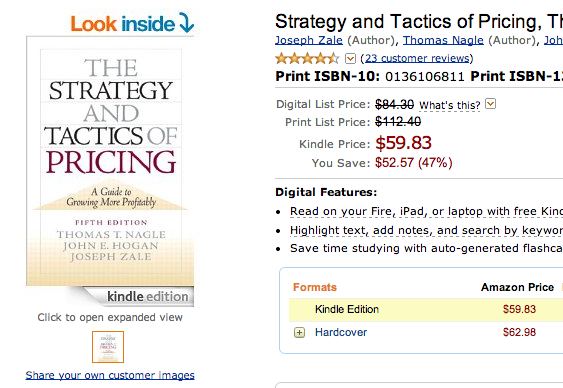 If I had to guess, the optimal price for a book, using Amazon’s numbers, would be more like $4.99. Of course, before you think, “well, Hachette/authors, will never accept that” remember that is a price that maximises revenue so why shouldn’t they. Moreover, it isn’t really surprising. After all, Apple actually had to argue with publishers and require them to cap prices at $14.99 (even for textbooks); making it a bizarre twist in the whole collusion story. This all suggests that we need to be careful in understanding these price elasticities. First, Amazon have released one number but even that number suggests that prices should be lower. So why aren’t Amazon pushing for that? Also, why isn’t Hachette happy to see its revenue rise? Second, we don’t know how Amazon arrived at this estimate. It isn’t easy to do although, as I see no reason why they would want revenue to fall, I don’t see why they wouldn’t be trying real hard to get the right number. The problem is that while they can use changes in the prices of individual books to tease out a price elasticity, what is much harder to do (although there are structural techniques to do so) is to work out what the optimal price should be in a new equilibrium where all books are priced at $9.99 and all other media it competes with for attention (as Amazon writes: “Keep in mind that books don’t just compete against books. Books compete against mobile games, television, movies, Facebook, blogs, free news sites and more.”) also have their prices adjusted. So it pays to be conservative here. Moreover, there is the looming issue of the prices of physical books and the revenue impact on them of lower ebook pricing that Amazon completely avoids discussing. That said, let’s look at Hachette’s current pricing. For the Kindle edition of the new Robert Galbraith (aka JK Rowling), it is currently $8.99 (the same as its iBooks price). Galbraith’s previous book, however, is $12.99 on Amazon and only $3.99 on iBooks so one suspects that Hachette isn’t playing this passively. Let’s look at the pricing of other publishers. Take, The Rosey Project (a fantastic book by the way) published by Simon and Schuster. It is $8.99 on Amazon and iBooks. Or The Martian (a really great book) published by Random House. It is $9.99 on Amazon and iBooks. Finally, let’s look at good ‘ol Piketty. It is $19.99 on Amazon and, oh that’s right, it isn’t available on iBooks. Isn’t that interesting? One datapoint for inter-platform competition there. The point of all this is that it is hard to imagine that Hachette’s dispute is over $9.99 per se (indeed, what Amazon is arguing for is a price rise based on some of this!) but more likely about who gets to set price on Amazon. In any case, if Amazon are confident that their calculations are right, then why not offer to under-write Hachette’s risks here. That is, guarantee to make up the difference if revenue doesn’t rise. There has to be some pricing arrangement that could share the risks here where, if Amazon do know better, they do even better. Is 30% reasonable? Yes. In fact, the 30% share of total revenue is what Hachette forced us to take in 2010 when they illegally colluded with their competitors to raise e-book prices. Suffice it to say, Amazon have a point here. 30% does seem reasonable. It is the common retailing take for publishing digital content whether it be books or apps. In this post, I have to admit that I have actually tried to play devil’s advocate against Amazon. While I can’t verify their claims directly, it is really hard to make a case that what they are asking for is outrageous. I look forward to Hachette being equally open about what they are asking for and why so we can evaluate this further. I feel like this should be a bigger part of the discussion. To the extent that an ebook cannabilizes demand from a physical book the marginal cost of producing the ebook will be much higher than $0.50 (because we want to take opportunity cost of that lost physical book profit into account). How does this compare to print book pricing? Do publishers dictate whether print books can be discounted and how much? A simplistic model of print books is that the publisher sets a wholesale price and the retailer then sets a selling price, normally designed to make a profit, but I’m not sure there’s any reason the retailer couldn’t sell books at a loss. For an ebook, Hachette could set a wholesale price of $12.00. If Amazon wants to lose money on each book, it’s their problem. I’m also curious — I thought that courts had ruled that manufacturers cannot enforce a specific retail price. I’ve been told it’s the reason prices are quoted as “manufacturer’s suggested retail price”. I don’t understand why ebooks suddenly mean the manufacturer (Hachette) can dictate the retail price. I see a different issue with ebook cost. Publishers try to argue have many costs which justify the seemingly high prices, yet too often it looks like the publisher took an electronic copy of the print book, blindly ran it through an ebook converter, and put it up for sale. I’ve seen too many ebooks with unlinked footnotes or even the footnote / endnote number attached to the end of the word rather than as a superscript, and then referring to an end-of-book note. I’ve never had the courage to try an ebook version of a textbook, it seems it would be too hard to navigate. You also mention an issue I’ve seen argued by many authors. Hachette’s royalty rates are far below Amazon’s suggested 35%. This combines with several claims I’ve seen by authors that publishers are making up ebook sales numbers (“why did I sell exactly the same number of ebook copies each quarter last year”) or are issuing ebooks they don’t have the rights to. In the end the Amazon / Hachette negotiations are like negotiations in many other areas. A big game of chicken combined with press releases (or the modern equivalent, blog posts) telling everybody how horrible the other side is.